Alright. I've restrained myself by not mentioning Old Russian Rifles for two whole issues, but now I'm breaking the fast. Our subject today is the rifle in the photo on the right, my first "Scout Rifle." A lot of you probably have some idea of what a Scout Rifle is, as pioneered by the legendary Jeff Cooper. The most familiar aspect of the Scout Rifle concept is the forward-mounted scope. But there's more to a Scout Rifle than simply mounting a scope over the barrel, rather than in the conventional position over the receiver. Much more. "Modern technology enables us to produce a rifle which need not sacrifice either power or accuracy to convenience. The new-wave rifle is neither more powerful nor intrinsically more accurate than the rifles of the past, but it is much, much handier - shorter, lighter, and quicker to operate. 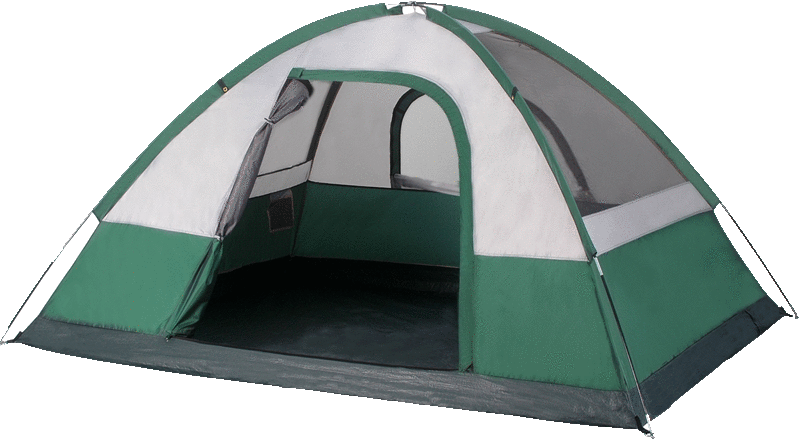 The current guideline is a length limit of one meter and a weight limit of three kilos. (This weight is measured with all accessories in place but with the weapon unloaded.) Immediately these limitations point us toward short actions, short barrels, compact sights, and synthetic stocks. A further feature which distinguishes the modern scout rifle from its predecessors is the telescope sight, but that in a certain particular mode. The modern scout uses a low-power telescope mounted just forward of the magazine well. In recent decades, progress in the development of telescope sights has been to a certain extent negative in that telescopes, instead of becoming stronger, smaller and faster to use have become larger, more cumbersome, more fragile and almost necessarily mounted too high above the bore. For those who have not tried it, an explanation of the advantages of the forward telescope is in order. First, and most important, the forward glass does not obscure the landscape. With both eyes open the shooter sees the entire countryside as well as the crosswire printed on his target. For this reason it is important that the magnification of the telescope be no greater than 3X (some hold that 2X is maximum) in order to avoid excessive disparity between the vision of the two eyes. This forward mount, properly used and understood, is the fastest sighting arrangement available to the rifleman. There are those who think that a glass of low power is necessarily less precise for long-range precision work, but we have not found this to be the case in any sort of realistic test. There are many additional advantages to the forward telescope mount. It is out of the way when the rifle is carried at the balance. It may be mounted as low over the bore as the diameter of the bell permits. It avoids pinching between thumb and bolt handle when the bolt is operated. It permits stripper loading if desired. It greatly facilitates single-loading with eyes on target. It completely eliminates "telescope eye." Without exception, those who have tried the forward mounted glass in a full course of rifle training are unanimous in their conviction of its superiority." Weight-sighted and slung: 3 kilograms (6.6 lb). This has been set as the ideal weight but the maximum has been stated as being 3.5 kg (7.7 pounds). Sighting system: Forward and low mounted (ahead of the action opening) long eye relief telescope of between 2x and 3x. Reserve iron sights desirable but not necessary. Caliber: Nominally .308 Winchester (7.62 x 51 mm) or 7 mm - 08 Winchester (7 x 51 mm), with .243 Winchester (6 x 51 mm) being considered for frail individuals or where "military" calibers are proscribed. Accuracy: Should be capable of shooting into 2 minutes of angle or less at 200 yards/meters (3 shot groups). Rifles that do not meet all of these specifications are technically not "scout rifles." Thus rifles of this general design in calibers other than those stated above are not true scout rifles but actually "pseudo-scouts." However, even though Steyr Mannlicher (and now Savage) are making production rifles of this general type (as well as some wild variations) they are under no legal obligation not to call their deviations "scouts" as a marketing tool. Thus the Steyr .376 Scout also known as (and probably better referred to as the ".376 Dragoon" although Jeff dislikes the term) nor the forthcoming .223 variation are true scout rifles. For that matter neither are the custom made scout-like rifles made up in .30-06, .375 H&H, or what ever caliber. However, there are many parts of the scout design that can be handily used on non-scout rifles." Hopefully, the foregoing has provided the reader with a relatively thorough grounding in the attributes possessed by a proper Scout Rifle. Jeff Cooper worked with Steyr-Mannlicher to bring the first and finest factory Scout Rifle to market. The Steyr Scout is a masterpiece of modern firearms engineering, and that fact is reflected in the rifle's price, over $2000. With this project, I have created a rifle which meets the definition of a Scout Rifle to maybe 80%, for $350, and you could do it too, if you wanted to, for even less. The base platform for my Scout Rifle (or is it really a Pseudo Scout? - we'll get to that later) is a Model 91/59 Mosin Nagant carbine. All M91/59's started life as long M91/30's. The exact history is a little murky, but it is believed that the M91/59 was born when the Russians went into a rifle refurbishment program starting in 1959 and on into the early 60's. By this time, shorter rifles were contemporary, so during refurbishment, they cut down their older M91/30's to carbine length and in so doing, created a new variation of the Mosin Nagant. My particular M91/59 specimen was originally manufactured (as an M91/30) in 1943. During the war years, production was naturally very pressed. I also have a standard M91/30 which was built in 1943. But the first thing you notice about the long rifle is how rough the receiver finish was left. It sort of looks like a beaver carved it out of a chunk of wood with his teeth! They were in a hurry to get rifles out the door in 1943, so a fine finish was considered an unaffordable luxury. However, the receiver finish on the M91/59 is satiny smooth. The original 1943 date stamp is somewhat faint and shallow, which leads me to believe that they cleaned up the metal finish as part of the refurbishment process when they rebuilt the rifle into the M91/59 configuration. I found the '59 at Big 5. The rifle was in overall excellent shape. It looked like it had never been used since the re-arsenal job. The wood was beautiful. The swirl of the wood grain underneath a clear yellowish-orange lacquer gave the stock the delicious look of butterscotch. The lacquer had chipped off in a few small spots, and there were a few minor compression dings and shallow scratches, as you might expect of a rifle which had been stored away for the last 40 years or so. The bore condition is pretty good, but you can tell that it's not new. The lands are shiny, but the grooves are slightly "frosty", but certainly not dark. For only $120, I consider the rifle a great buy! 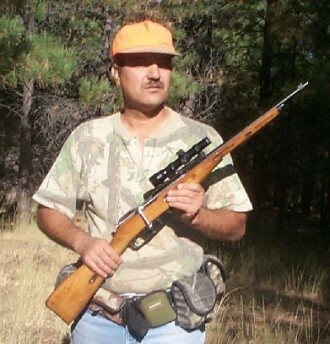 In this year's May issue, I discussed my first Mosin Nagant, the M44 carbine. The M91/59 at first glance, looks very much like an M44, but there are some key differences. 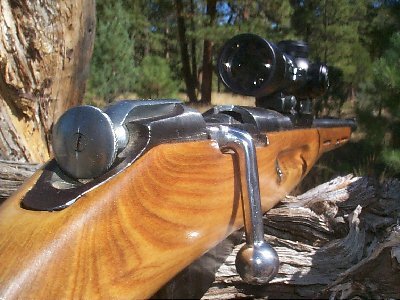 In fact, when I saw the 91/59 on the rack at Big 5, I told the manager, "I'd like to take a look at that M44 Mosin Nagant." He played it coy, and said, "I'm sorry. We're all out of M44's right now." I had to blink my eyes, because I was staring right at the Mosin Nagant carbine behind him. Finally, he let on that it was an M91/59, not an M44. The most obvious difference is the lack of a built-in bayonet on the 91/59. It's surprising how much of a difference that makes in the feel of the rifle. Without the extra weight out front, the '59 feels so much livelier in the hand, and the balance of the piece is so much better. But it's the difference in the rear sight that makes the 91/59 particularly suited for "Scouterizing." The M44 and the earlier M38 carbines have true carbine sights. 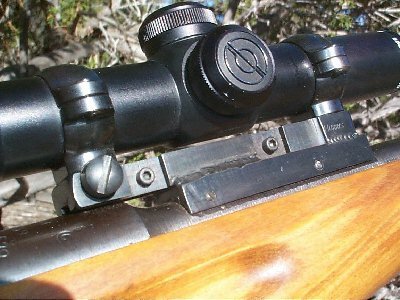 The rear sights are shorter in overall length and they are not graduated to as far a distance as the M91/30 rear sight. The 91/59 retains the M91/30 rear sight, though the distance graduations beyond 1000 meters have been scrubbed off. For Scouterizing purposes, the important thing is that the sight base on the 91/59 can be easily removed from the barrel. Those on the M44 and the M38 cannot. There is a tapered dovetail machined into the top of the barrel. The rear sight base slides onto this dovetail, and is fixed in place with two crosspins. By punching out these two pins, the sight base can be slid forward and off the barrel. After removing the sight arm and the flat spring from the sight base, I used a cut-off wheel on a Dremel tool to shave off the "roller coaster" ears on the sight base. Then I flat-filed the cut-off sight base until all four corners measured equal in top-to-bottom thickness. I've had a Burris revolver scope mount lying around in a drawer for a number of years. I was so happy to finally find gainful employment for it. I took the Burris mount and the cutoff sight base to a local precision welder. For $20, he made the two pieces into one. The job wasn't perfect, though. The Burris mount was slightly angled on the sight base. But, because the Burris mount has windage adjustability in the rear ring mount, the angle was easily tuned out. The scope sits nice and low. The ocular bell is about �" off the front receiver ring. Though it appears to, the rear of the mount does not contact the fat part of the barrel. A piece of card stock can be slid between the rear of the mount and barrel. This is a very solid and secure scope mount setup. I decided to use a Simmons 2x pistol scope. I've used this model of scope on a couple of different scoped handguns over the years, with never a problem. This scope has a minimum eye relief of only 9 inches, just about ideal for Scout Rifle purposes. I contracted for a bent sniper bolt body for yet another M-N project rifle, an M91/30 PU sniper, but when the bolt came in, I put it on the Scout just for fun, and decided that I liked it there. The turned down sniper bolt is a nice added ergonomic feature. I guess I'll need to get another bent bolt for that sniper project. As for the stock, I stripped all of the original finish off the wood so that I could sand out those minor dings and scratches. As soon as I got down to white wood, I started sufferring from Bubba's remorse. I really liked the butterscotch color of the original finish, and the way the grain of the wood was highlighted through the finish. After I finished sanding the stock smooth, I wanted to figure out how to re-create the original color. I started by staining the white wood with a rosewood stain. The wood sucked up the stain like a thirsty desert traveller. The reddish color covered the grain pattern pretty evenly, not allowing the grain to show off. I grabbed some 600 grit wet or dry sandpaper and dipped it in some paint thinner to wet sand the stock. This was effective in allowing some white to show between the darker wood grain stripes. My next step was to throw some Golden Oak Watco Danish Oil Finish over the stain. This color of oil finish is very yellow. I was hoping that the yellow over the red would get me that butterscotch color I was looking for. After a couple of coats of the oil finish, the stock started looking like . . . well, golden oak . . . which really wasn't so bad, but it wasn't quite what I was looking for. So I grabbed another can of Watco off the paint shelf - this one was Dark Walnut. I needed to darken the tone up a little. With the previous coats of oil finish already into the wood, I was confident that that the Dark Walnut would not soak in to overdarken the color. So with three coats of Dark Walnut over four coats of Golden Oak over the wet-sanded rosewood stain, I didn't quite get the original Russian butterscotch, but I was quite happy with the end result. But I wasn't finished yet. I like to finish up with a polyurethane wrapper to stabilize the wood, keeping it waterproof and simple to care for. Five coats of satin poly spray completed the job. In creating this Scout, there was one thing I was not willing to do -- I was not interested in making any irreversible changes to the gun such as chopping the stock or cutting the barrel. I wanted to be able to put it back to original configuration if I ever wanted to. Yes, I chopped the sight base, but the sight base is easy to replace. On the other hand, I did want to get as close to proper Scout Rifle parameters as I could. But my unwillingness to make any significant changes led to a major violation of the Scout Rifle specs. My spring fish scale says that the Scout weighs a full nine pounds, or 4.1 kg, which is .6 kg over the weight limit. I did the best I could to put the rifle on a diet. The upper handguard was jettisoned along with the barrel bands and the barrel band keeper springs in the stock. The cleaning rod was also set aside. But I was not about to put the rifle into an ugly plastic stock as Cooper prefers. Let's say that you don't care about maintaining the ability to put the rifle back to original. What else could you do? You might saw off the lower handguard part of the stock. You could turn the barrel down to a slimmer profile. You could at least cut the barrel back another inch or so to lose the front sight mount. Here's another violation of the Scout Rifle specs: the barrel length is 20", giving the rifle an overall length of 40" - These numbers are over-length by one inch each. Scout Rifle specs would prefer the rifle to have some sort of backup iron sight capability, but I just couldn't get there with this rifle. The hooded front sight was clearly visible through the scope and proved an annoying distraction. So I also removed the front sight by drifting it out of its dovetail. My Scout weighs 4.1 kg. Violates spec by .6 kg. Mine is 40". Violates spec by 1 inch. Mine is 20". Violates spec by 1 inch. Sighting system: Forward and low mounted long eye relief telescope of between 2x and 3x. Reserve iron sights desirable but not necessary. The scope and mount system meet specs, but there are no reserve iron sights. Meets spec -- Mine is a stripper charged, magazine fed bolt action. I've never given a thought about slinging my Scout. Violates spec. The 7.62x54R caliber is almost identical to the .308 Winchester in ballistics, especially in a short barrel. I'm going to claim that I meet spec on this one. Accuracy: Should be capable of shooting into 2 MOA or less at 200 yards/meters (3 shot groups). The rifle's favorite loads achieve 1.6" 5-shot groups at 100 yards, but I have not yet tested the rifle at 200 yards. Provisionally, I meet spec. If the rifle didn't blow past the weight spec so badly, I wouldn't feel embarrassed in the least claiming full Scout Rifle status for mine, but I'm afraid that I'll have to settle for the Pseudo Scout title. Due to the fact that my case of Russian Fever rages on, I'm still very pleased with this handy little woods carbine, despite a little extra weight. If you lose the bent bolt, substitute a 2x BSA pistol scope ($50 from Midway), and don't refinish the stock, you could save $120. Yes, you too could have your very own, very competent (Pseudo) Scout Rifle for only $230! Now that's what I call a Cheap Scout! Related story: "... Pull Those Pistols ..."